As long time readers know, I like to use the 10 Day Moving Average of the NYSE Advancers-Decliners to measure when the market is oversold. At the current juncture the market is slightly oversold. Below is the raw data that goes into the calculation, the last 10 days of NYSE Advancers-Decliners data. 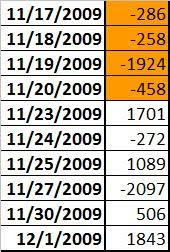 For the next 4 days the market will be dropping negative numbers, which I highlighted in orange. That should be supportive of the market. So why is the picture murky? Because that is about the only indicator I could find that is supportive of the market, although it is an important one. Sentiment is not confirming the oversold reading. The S&P is less than 1% from its recovery high close. In this instance the A/D 10 day average is misleading. It's hard to argue that this market is oversold. That is the measure I use. I can't ignore it just because I dont like what it is saying. My other indicators are not confirming, so I am neutral. But this stops me from getting bearish. 10 trading days ago the S&P 500 was in the exact same place and the market is very slightly oversold. Its not so far off. 10 trading days ago the market was overbought and it worked off that reading by going sideways.